Jez Hellard is a singer of potent songs, fine guitarist and simply stunning harmonica player. 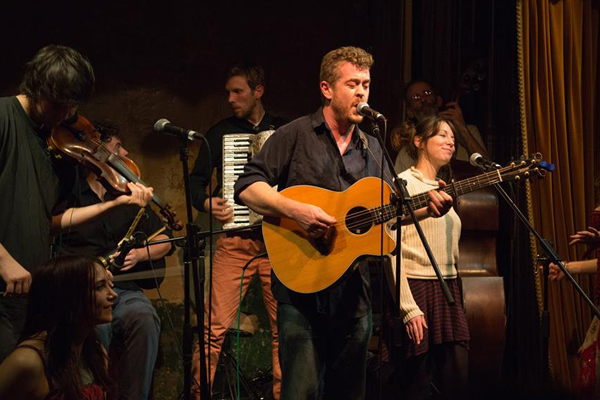 His band, The Djukella Orchestra, play traditional and contemporary folk music, from jigs, reels and rebel ballads to tango, rhumba and even reggae. Featuring one of the most captivating double-bassists you’re likely to hear and some of the finest instrumentalists on the UK folk scene, their blend of virtuoso musicianship, witty political comment and a deep repertoire of powerful songs never fails to turn heads. The word Djukella is a common insult in the Balkans, meaning mongrel, and goes some way to describe the mixed provenance both of the music and the musicians themselves. In the past decade Jez and various djukellas have played well over a thousand gigs; from the Glastonbury Festival to the North Country Fair, New York to Taipei, Istanbul to the Iberian Peninsular.